Update: Next Fort Toulouse - Fort Jackson frontier days are on November 7, 2018 - Mark your calendar. Elmore County was created by the Alabama State Legislature February 15, 1866. Its territory was originally a part of Autauga, Coosa, Montgomery and Tallapoosa Counties. It includes within its boundaries the rich lands at the junction of the Coosa and the Tallapoosa Rivers. The county was given the name of John Archer Elmore, a native of Virginia, a soldier of the Revolution in the Virginia Line, afterward a member of the legislature of South Carolina, an early settler of Alabama, and a member of the legislature and a general in the militia of this State. His home was in that part of Autauga, now included in Elmore, and his remains rest in the old family burying ground at “Huntington,” his family seat. Located just south of Wetumpka where the Coosa and Tallapoosa rivers meet to form the headwaters of the Alabama River, visitors will find over 6,000 years of history at Fort Toulouse-Jackson National Historic Park. 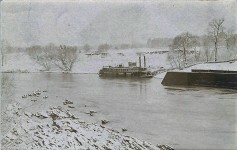 The Fort was also referred to as the Post of the Alabama, named after the Alabama Tribe of Upper Creek Indians, who resided just below the confluence of the Coosa and Tallapoosa Rivers on the upper reaches of the Alabama River. 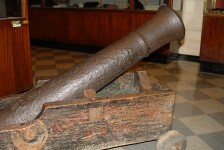 The French founded the fort in 1717, naming it for Louis-Alexandre de Bourbon, Comte de Toulouse. 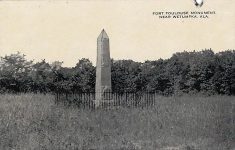 In order to counter the growing influence of the British colonies of Georgia and Carolina, the government of French Louisiana erected a fort on the eastern border of the Louisiana Colony in what is now the state of Alabama. Elmore County is situated in the east central section of the state. It is bounded on the north by Chilton, Coosa and Tallapoosa, east by Tallapoosa, south by Macon and Montgomery, and on the west by Autauga and Chilton Counties. Its eastern boundary is the Tallapoosa River. On the south, it is divided from Macon and Montgomery by the Tallapoosa and the Alabama Rivers. 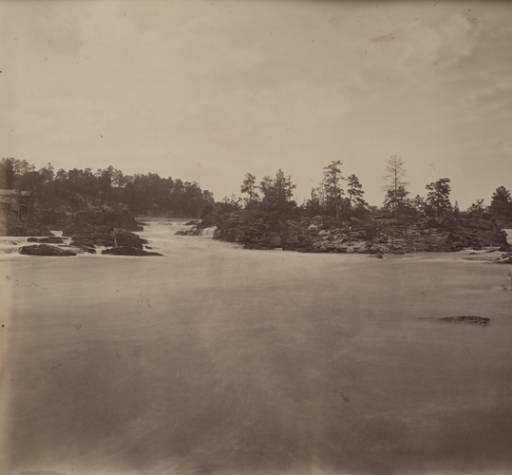 Along the Tallapoosa is a marginal strip of alluvial soil from one to three miles in width. A large part of the county on the south is included within the coastal plain region. The topography of the Piedmont plateau in the north and northeast is rolling and hilly with ridges and hills east of Wetumpka. 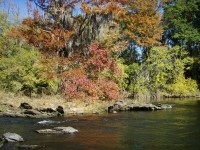 Along the upper Coosa and Tallapoosa Rivers are steep hills and bluffs, affording extensive variety. 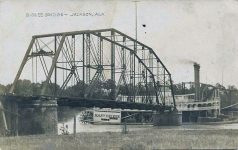 The Coosa and Tallapoosa unite on the lower border of the county, and form the Alabama. The principal tributaries of the Tallapoosa are Kialiga, Channahatchee, Wailahatchee, Tumkeehatchee and Chubbahatchee Creeks. The drainage from the east to the Coosa River is through Welona, Town, Weoka, Pinkston and Sofkehatchee Creeks. The drainage to the west into the Coosa is through Cargal, Shoal, Pigeon Roost and Calloway. In the southwestern section of the county Mortar Creek drains into the Alabama River. The county is rich in the territory, and was perhaps more densely peopled than any other section of the Creek Nation. Practically all of its many village sites can be identified. 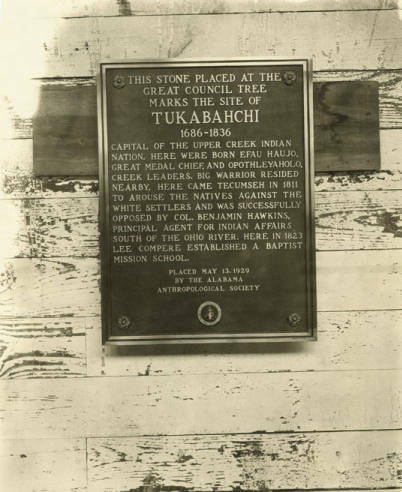 This Tukabahchi plaque was erected May 13, 1929 by the Alabama Anthropological Society. Woksoyudshi. 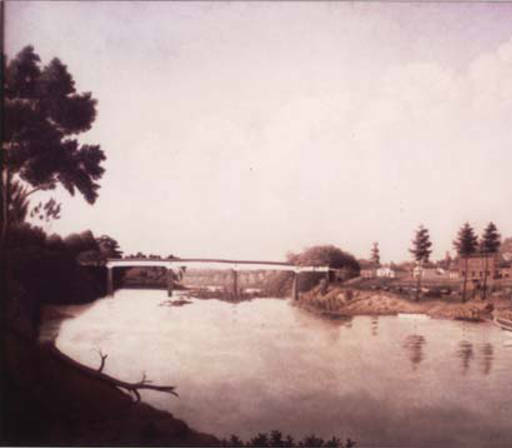 an Upper Creek town, mentioned in the Census list of 1832, as on Coosa River below Witumka. Oktchayi on a western tributary creek of the Tallapoosa River, were all located in the county. DeSoto passed through its bounds on September 1, 1540, entering it near Central, and after visiting Ulibahali, crossed the river just below the present Ware’s Ferry. 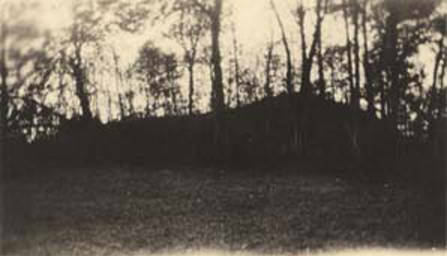 Large mounds and town site at the present junction of Tallapoosa with Coosa Rivers (the site of Taskigi); mounds and town site on west side of Coosa River one mile above the junction (probably site of Woksoyudshi; mounds on Parker’s Island in dense swamp near the junction; large burial mound on Jackson’s Lake and near the present course of the Alabama River; 2 mounds and burial site on Jackson’s Lake. 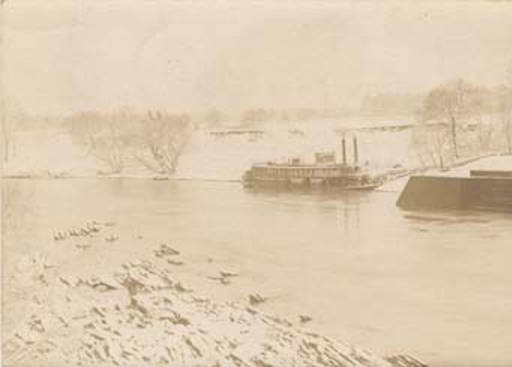 400 yards southeast of the clubhouse; mound on Alabama River, about 5 miles above city of Montgomery, near the toll bridge on Montgomery and Birmingham road; burial mound and extensive town site on Jackson plantation, just above Coosada Ferry (site of Koassati); mound on Cbubbahatchee Creek, above the site of Hoithlewalli (probably old site of the town); mound and village site on Dozier plantation, on north side of Tallapoosa River from Ware; mound at site of old Tuckabatchi; large mound and town site on plantation of L. G. Dawson of Ware, one mile due northwest of Merritt’s station on the Western of Alabama R. R.; and extensive sites along Tallapoosa River, below Ikanhatkl and opposite the several mounds on the Montgomery County side. Painting of covered bridge over Coosa in Wetumpka ca. 1847 Alabama State Archives by Adrian E. Thompson Original in Museum of Fine Arts, Boston, Mass. 1867—Charles M. Cabot, Benjamin W. .Norris. 1901—John H. Parker, A. E. Williams. 1896-7—G. 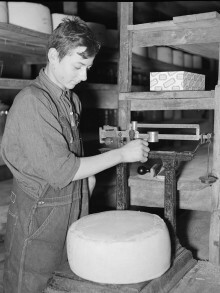 B. Deans (of Shelby). 1903—Andrew Wooley Rucker, Owen Calvin Swindall. 1907—W. L. Lancaster; Lamar Smith. 1907 (Spec.)—W. L. Lancaster; Lamar Smith. 1909 (Spec.)—W. L. Lancaster; Lamar Smith. 1911—R. L. Huddleston; J. M. Johnson. 1915—A. C. Rogers; Dr. O. S. Justice. 1919—H. C. Ellis; J. A. Holmes. Boyer, Lewis, Gant, many other families settled in Coosa County & are buried there. Everyone should visit Fort Toulouse for Frontier Days!! It is important in our states history and is a great event. My brother, Richard Cumbie is a re-enactor each year. Much to learn and fun as well. Wetumpka, Deatsville and Holtville are my old childhood stomping grounds. My grandparents and extended family are from there. Surnames of Richardson and Blankenship. My in-laws lived in Tallassee; grandpa born in Dadesville; store in Dudleyville. Grandpa was part of the scientific team developing(?) 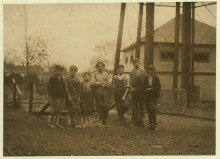 Lake Martin in the 1920’s(?) and tells of towns being inundated with water when the Lake filled in. Rode wagon with his father, the doctor, visiting patients; he later became a doctor as did many others in his family. He had so many fascinating stories about the area. Names of Fargason, Carlton, etc. We are so thankful our grandson and family are safe in Wetumpka! Prayers for people living there. I remember this about the city: Tutwiler Prison for Women. Would drive by many years ago when visiting aunt in Kent.